Professor Chyi-Long Lee presents APAGE (Asia-Pacific Association for Gynecologic Endoscopy and Minimally Invasive Therapy) honorary membership to Dr. h. c. mult. Sybill Storz. Tuttlingen, 4/3/2018: During a visit to Tuttlingen, the Taiwanese gynecologist and board member of the Asia-Pacific Association for Gynecologic Endoscopy and Minimally Invasive Therapy (APAGE), Professor Chyi-Long Lee, conferred APAGE honorary membership to Dr. h. c. mult. Sybill Storz. For more than 13 years, KARL STORZ and APAGE have maintained a very close partnership for promoting medical training and continued education. Through honorary membership, the association now honored the continuing support of endoscopic training provided by Sybill Storz personally as well as by the company KARL STORZ. "I accepted this distinction with profound gratitude. I am delighted with the confidence placed in us by allowing us to support the Association's training activities in such a variety of ways. 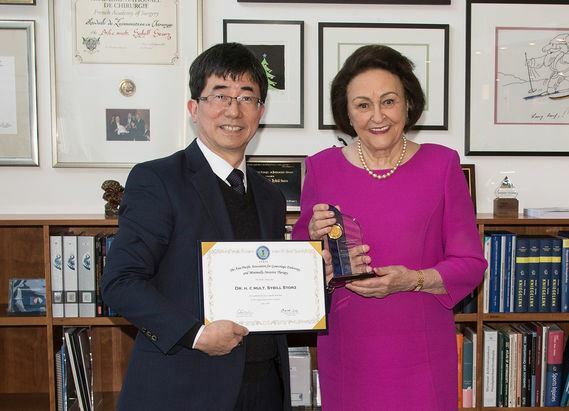 I would like to hereby cordially thank all APAGE members and board members for the longstanding collaboration as well as for this award, which I am very honored to receive," said Dr. h. c. mult. Sybill Storz. The Asia-Pacific Association for Gynecologic Endoscopy and Minimally Invasive Therapy (APAGE) was established by a group of committed surgeons from the Asia Pacific region in 2003 and today represents 13 Asian associations of gynecological endoscopy. Currently, the APAGE umbrella organization has more than 1000 members. APAGE is committed to jointly promote research and professional training opportunities in gynecological endoscopy and minimally invasive surgery. The Association offers physicians intensive training programs such as hands-on workshops and workshops on laparoscopic cancer surgery as well as on NOTES and robotic surgery. Furthermore, APAGE maintains various training centers in the Asia Pacific region in which physicians can gain current knowledge in gynecological endoscopy as well as exchange experiences. Copyright © APAGE All Rights Reserved.